Travel with us, if you will, back to about a year ago when something called the Ostrich Pillow was making waves across the internet with its lofty promises of a napping revolution. But the Ostrich Pillow was made for full grown sleepyheads; no kids allowed—until now, that is. 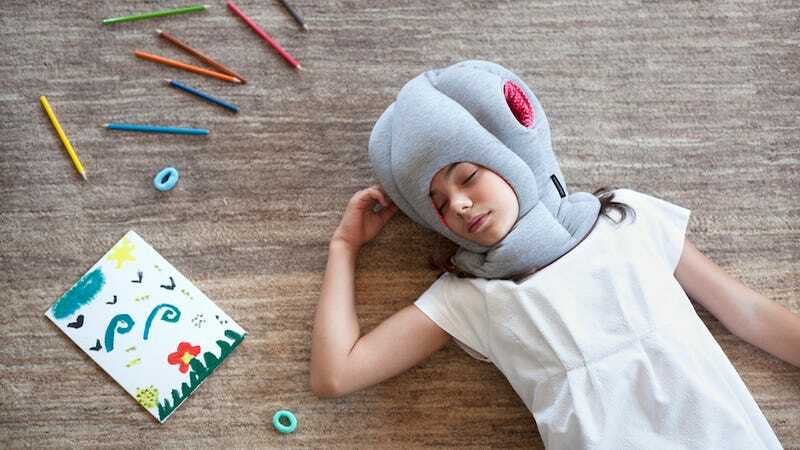 Today, you can purchase for your child or otherwise small-headed friend an Ostrich Pillow Junior. Because nothing helps kids grow up quite like the merciless mocking of their peers. After beginning its life as a Kickstarter, the Ostrich Pillow reached its funding goal thanks to a campaign built on a platform of naps for the masses. No matter where you go, no matter who you're with, simply put on your Ostrich Pillow, slip in your hands, and drift off to Slumber City as you sonically (and, we presume, emotionally) isolate yourself from everyone around you. And since no one loves standing out and being highly conspicuous amongst their peers quite as much as tweens, the Ostrich Pillow Junior comes in two delightfully somnolescent colors: Berry Snooze and Dreamy Waves. The children's version does come with a larger face opening, so both your child's nose and eyes are freed from darkness. And sure, that's nice and all, but not blocking light kind of seems to defeat the whole purpose. Either way, it can be all yours for the low low price of... $75. Which might sound absurd for what's effectively a beanbag with strategically placed holes, sure, but at least it's better than the adult version—that one will set you back a cool $100. So if you and your kid love to nap, have cash to burn, and suffer from too many people willing to acknowledge you in public, you've just found the answer to your collective prayers.